Anaesthesia is the total loss of sensation in a body part or in the whole body, generally induced by a drug or drugs to create loss of feeling, unawareness and muscle relaxation either locally, regionally or centrally. There are many reasons for administering anaesthetics to animals; the main purpose is to provide a convenient, safe and effective means of facilitating medical and surgical procedures while minimising stress, pain, discomfort and adverse side effects to your pet and the veterinary team. Herding breeds (e.g., Shetland sheepdog, Australian Shepherd, Border collie) – a genetic mutation that allows a select group of drugs to accumulate within the brain, which may cause marked sedation and respiratory depression. As with all aspects of medicine, complications will occur with anaesthesia. It has the potential to compromise your pet’s state of being at unpredictable times and in unpredictable ways, including causing animal death. Therefore, a thorough assessment of your pet is made before they undergo anaesthesia to maximise safety and minimise the potential for complications. A personalised anaesthesia plan will be created and addresses pre- and post-anaesthetic sedation and/or tranquillisation, induction and maintenance drugs, perioperative pain relief, ongoing physiologic support, monitoring parameters, and responses to adverse events. You will be asked to withhold food and water for your pet before the day of procedure for a certain time to reduce the risk of regurgitation and aspiration, which means breathing in the contents of the stomach and gastric juices into the lungs. Your veterinarian or veterinary technician will explain the procedure to you and discuss the patient assessment and risks, the proposed anaesthesia plan, and any medical or surgical alternatives before obtaining informed consent to anaesthetise your pet and perform the procedure. To help reduce the risk of complications, it is very important that you follow the directions of the veterinarian, especially regarding patient preparation. A variety of monitoring equipment is available for determining your pet’s status during anaesthesia. Improved anaesthetic safety depends on both the correct use of equipment and the correct interpretation of information obtained. Written anaesthetic records are sometimes used. Despite the electronic aids available, the most important monitor still remains a dedicated vet / vet nurse who is constantly monitoring the patient. Many drugs used for general anaesthesia tend to cause blood pressure to decrease. Intravenous fluids administered during anaesthesia will counter this decrease. In addition, if there are any adverse reactions under anaesthesia, an intravenous catheter allows immediate administration of emergency drugs. 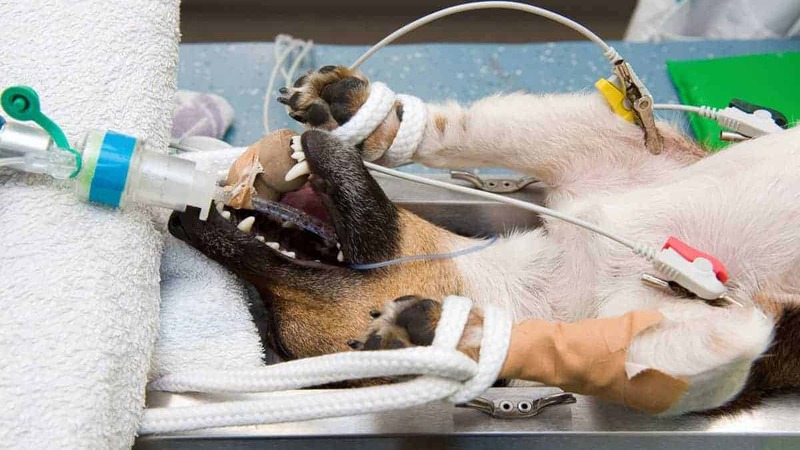 All animals, especially cats and small dogs, lose a lot of body heat under anaesthesia. The resulting hypothermia can slow the anaesthetic recovery. Anaesthetised pets are placed on a recirculating warm water pad and / or under a warm air blanket. Pets are generally intubated when undergoing anaesthesia, which means that they have an endotracheal tube placed through the mouth and into the trachea, through which anaesthetic gas is administered. The endotracheal tube allows controlled respirations if your pet is not breathing well on their own, and prevents regurgitation if the pet vomits under anesthesia. Some effects may last for 12-24-hours after anaesthesia. Review the procedure and how it went. Explain follow-up care, including when your pet can begin to eat and drink. Explain how to recognise signs of complications in your pet. It is important that you call your veterinarian immediately if your pet has a complication. Tell you when to bring your pet back for a re-check. In addition to telling you the instructions, the veterinary team should give you a written copy of the aftercare instructions. Anaesthesia is more than the delivery of anaesthetic drugs. With proper perioperative assessment and appropriate patient monitoring, safe and successful anesthesia can be performed in any breed of dog. 1. “Veterinary Information Network (VIN) – For Veterinarians, By Veterinarians.” Veterinary Information Network (VIN) – For Veterinarians, By Veterinarians. Web. 18 Apr. 2015. <http://www.vin.com/>. 2. Muir, William W., John A. E. Hubbell, Richard M. Bednarski, and Phillip Lerche. Handbook of Veterinary Anesthesia. 5th ed. St. Louis: Mosby, 2013. Print. 3. Bednarski, Richard, et al. “AAHA Anesthesia Guidelines for Dogs and Cats.” American Animal Hospital Association. 1 Jan. 2011. Web. 16 Apr. 2015. 4. 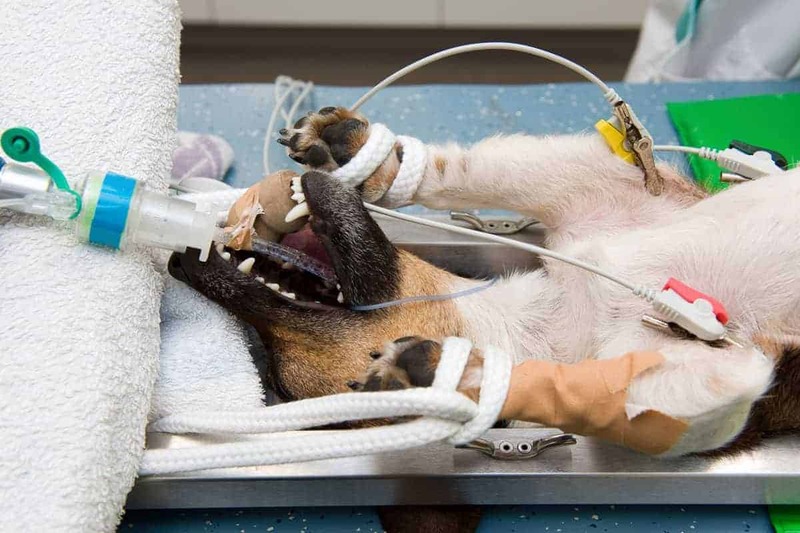 “Canine Anesthesia.” www.vetlearn.com. 1 Jan. 2011. Web. 17 Apr. 2015. This article is written by Dr Clare Koh of The Joyous Vet Pte Ltd. Dr Clare Koh graduated from the University of Queensland. She has special interests in emergency and critical care and internal medicine. Dr Clare finds a great sense of satisfaction through helping pet owners and their fur kids. She believes that keeping up with the latest information in vet medicine will allow her to serve them better. Whenever away from the hustle and bustle of the clinic, Dr Clare winds down by watching movies, reading fiction, and cycling.